This first expansion fills the game with big historical moments and crises. Rise and Fall is a great addition to Civilization 6 that doesn’t quite go far enough to be essential. What is it? A tumultuous expansion that finally introduces golf to Civilization. Continuing the last couple of Civilizations’ penchant for ‘unstacking’, Civilization 6: Rise and Fall has peeled apart more of the series’ fundamental systems. This time it’s the march through history itself. It’s more dynamic and messy, with civs—as the title promises—rising and falling as they enter new eras and experience Golden and Dark Ages. Yet Civilization has rarely felt this structured or cohesive. Eras divide Civilization, representing a civ’s technological and cultural level. In Rise and Fall, the system has been been spun out into two different types of era: player eras and game eras. Player eras are the mark of a civ’s individual progress, while game eras start and end at predetermined moments and affect every civ. The result is that you'll still be rewarded for investing in science and planning ahead, but if you don't, there’s going to be a fixed point where the new era officially begins, so you're not going to fall too far behind. 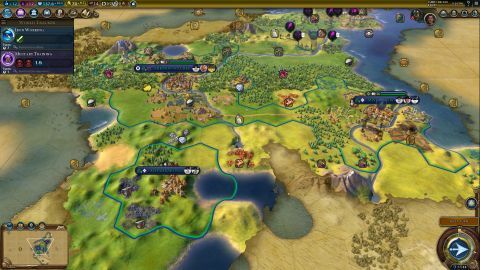 It’s a nudge towards parity that keeps things interesting without diminishing the rewards for having the most enviable civ. And what is an otherwise daunting, massive game is split up into discrete, manageable chunks and accompanying objectives. It’s with the introduction of Golden and Dark Ages that things get a bit messier. During a game era, every civ is in an unacknowledged race to increase their era score with historic moments. Being the first civ to befriend a city state, killing your first bandit camp, making a city a commercial centre—anything that represents an important decision or a world-first can net you points. Depending on how many you have, the next era will be a normal, Golden or Dark Age. These ages affect the loyalty of your citizens and let you pick era-long buffs that give you new abilities, like recruiting builders by spending faith, or make it easier to accumulate era points through things like building districts or conquering. Get a Golden Age and you might see your civ enter a period of unparalleled prosperity with every city praising your name, while a Dark Age could spell civil war as citizens become disloyal and revolt, turning their cities into free cities that can be snatched up or seduced by other empires. Cree Alliances and trade are the Cree specialities, and traders can even bring tiles under Cree control. Netherlands Trade and culture is the Dutch brand, while rivers are where they should set up shop. Scotland A civ that balances science and production while liberating cities and filling the world with golf courses. Zulu A martial civ that can make corps and armies early and comes with a unique military district. Georgia This religion-powered civ likes to declare protectorate wars because it gets a whopping 100% boost to faith. Korea A science-based civ with its own science district and extra benefits from having governors in cities. Mapuche When Mapuche units beat up enemies, nearby enemy citizens are so impressed that they become disloyal. Mongolia The Mongolians obviously get cavalry bonuses, but its their trading posts that make them really dangerous. Rise and Fall and Maybe Rise Again doesn’t have quite the same ring to it, but a Dark Age isn’t the end. It introduces new challenges, certainly, but they’re all surmountable, and indeed there are even some advantages. If you’ve not expanded too quickly and your cities are pretty loyal, then you’ll likely make it through relatively unscathed. If you’ve done particularly well and gathered enough era points during the Dark Age, you’ll enter a supercharged Heroic Age. If anything, it could stand to be a little harsher, though I do appreciate that it feels less like a punishment and more like a very different, slightly trickier path. I’ve yet to see it fully realise its promised potential, however. It’s unpredictable, but properly huge upheavals have been largely absent in my games. There have been a few large-scale international emergencies, though. These are new cooperative events that task civs with banding together to solve a crisis, targeting another empire. In my game as Scotland and Robert the Bruce, I sparked one myself when I converted the Catholic holy city of Seville to Protestantism. It essentially created a mission where I had to hold it for 16 turns and the rest of the world had to stop me. Unfortunately for Spain, only a few friends lent a hand and I got myself a cash reward and an explosion of faith that converted yet another city. It helped that I had a religious governor—one of the seven new upgradable characters who make specialised cities—in my capital, churning out faith for me that I could spend on more missionaries. While the objectives are simple and the AI isn’t a great team player, it’s a very effective way to force civs into big conflicts, making the world a bit livelier in the process. Perhaps more importantly, it turns what could have been overlooked moments into historically significant events. I wouldn’t have remembered the conversion of Seville in any other game, but now I remember it as this long religious siege with Spain and its allies furiously summoning lightning bolts out the sky in an effort to rid the city of my religion. That’s what lies at the core of Rise and Fall. It’s an expansion that homes in on these single moments or specific periods and gives them greater meaning and impact. Sometimes, though, it can be hard to see the big picture, especially when you’re desperately trying to get enough era points and time’s running out. It shakes things up, so it won’t convert everyone, but the added tension and dynamism is a massive boon for a series where the pace can be a bit predictable.